We’re back to break the silence, and we have so much to tell you. Moreno and I have spent the past two weeks trekking between minority villages in search of our final subjects here in Myanmar. We’ve faced electricity shortages, equipment failures, monsoonal rains, misinformation, rapidly expiring visas, and encounters with the police, army and immigration officials. It’s been the most intense – and intensely successful – phase of the project to date, and we have so many new stories and photos to share with you. Over the coming days and weeks, there’ll be plenty of backdated posts appearing as we do our best to catch up with ourselves. 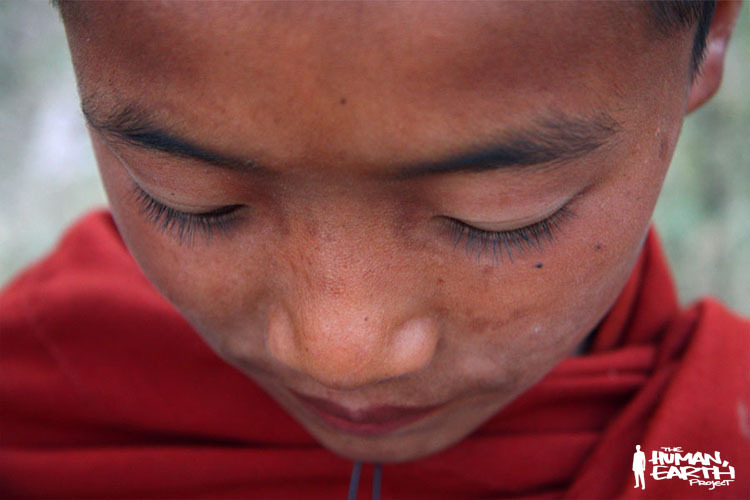 The first subject we went in search of is the first subject of the entire collection – the young novice monk of The Human, Earth Project title image, whose eye also appears on our logo. His name is Nga San, and he now works as a farmer on his father’s land, twenty minutes’ walk from the monastery where he once served as a novice monk. His parents are divorced, surprisingly, and his three brothers live with their mother in her village, two hours’ walk away. More than that, it became clear within moments of meeting him that Nga San is a gentle, warm-hearted human being. It was not a fact that required translation. Meeting him, I realised that all of the subjects we’ve found so far have impressed me as good people. Is it because I’ve been searching for the good in them? Is it because they’ve all been on their best behaviour before the cameras, enjoying their moment of glory? Or is it because the good in people becomes evident once you spend a little time with them, and pay a little attention to what they have to say? Moreno and I have something to show for those rainy days, too. We’ve been busy overhauling the website to reflect the way The Human, Earth Project has grown, and with increased emphasis on human trafficking. So if you haven’t seen the site lately, it’s a great time to check it out, at www.humanearth.net (the new content is currently available only in English, Spanish and Italian). The new site is the first of many changes we have planned for The Human, Earth Project over the coming months. We’d love to hear your thoughts and suggestions, particularly with respect to the blog. At times I tell stories with broader strokes; other times I focus on the details. Some are personal reflections; others touch on broader, socio-political themes. What works for you? What doesn’t? Would you like to hear more about the search, the people we discover, or the world in which it all takes place? Let me know right here!